Online Revolution Month 2013 -- Get the best deals on the biggest Cyber Event of the year! This Online Revolution Will Make You Shop Til You Drop! Online shopping is a common activity in all corners of the globe. Individuals now prefer online shopping because of the convenience, hassle-free and easy browsing of a wide selections of items – from food, to clothes, to small and big gadgets and many more. In the Philippines, online shopping is rapidly becoming popular as more and people see the genius behind shopping from their own homes or offices. Consumers also find it more convenient to shop and browse for their favorite items online rather than spending hours in traffic just to go to a mall or shopping complex. 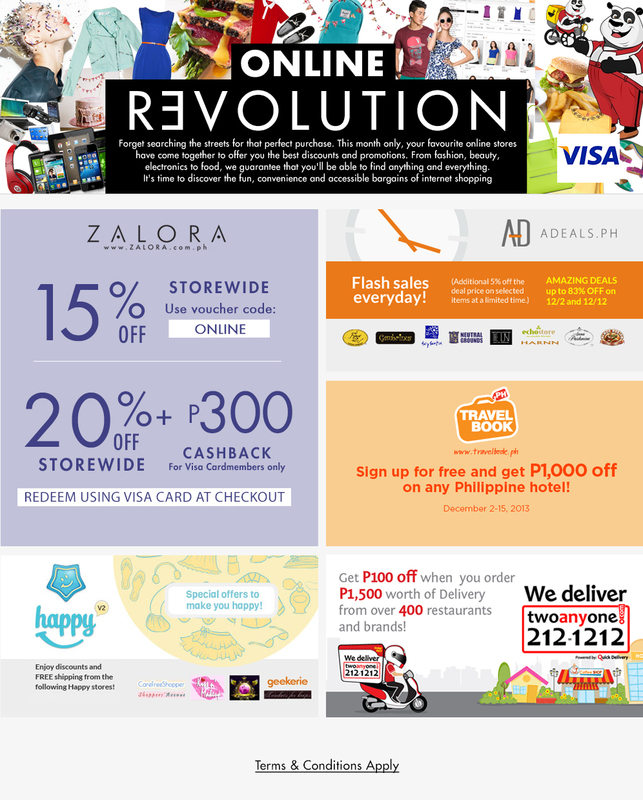 If the United States and other countries have the Black Friday and Cyber Monday sale events in kicking off the holiday season, the Philippines has the Online Revolution from the front runner in online shopping, Zalora PH. For this massive online shopping event, online consumers can enjoy shopping to their hearts’ content with the biggest selections of items ranging from apparel, bags, shoes, accessories to electronic gadgets and so much more! How the Online Revolution Works! The online revolution offers 10% off on already low-priced items for both men and women. This sale is month-long, starting from the 11th of November and ending on the 11th of December 2013. In order to avail of this great discount, consumers must input the code “ONLINE” in the checkout process. For Visa credit card holders who will buy at this online merchant, they can enjoy 15% price discount plus a whopping Php 300 cash back when they buy products using their Visa card from the same date. Upon check out, consumers only need to input the code “VISAONLINE”. Get ready to shop online for the gifts for your loved ones as well as gifts for yourself!